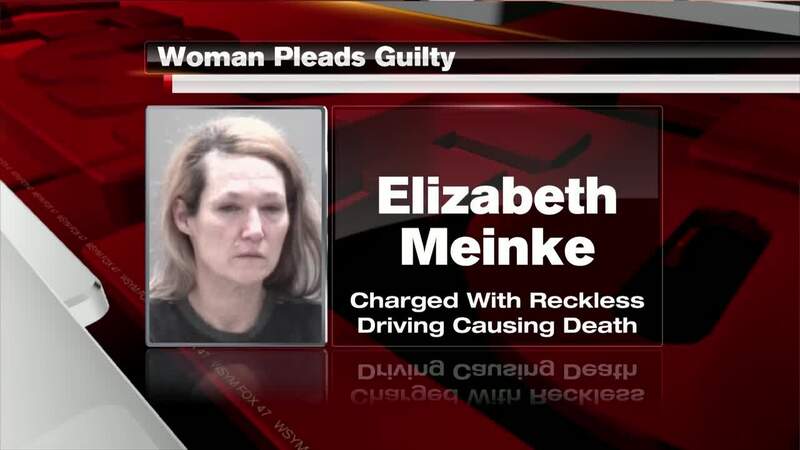 Elizabeth Meinke pleaded guilty as charged to reckless driving in the death of a pastor. Meinke, admitted to reckless driving in the death of 51-year-old Timothy Olson. She will have a delayed sentence, which means she won't go to jail so long as she follows through with her agreement. CHARLOTTE, Mich. — Elizabeth Meinke pleaded guilty as charged to reckless driving in the death of a pastor. Meinke, 47 of Charlotte, admitted to reckless driving in the death of 51-year-old Timothy Olson. She will have a delayed sentence, which means she won't go to jail so long as she follows through with her agreement. She must not drive, will have a mental health assessment and comply with recommendations, have substance abuse assessment and comply with recommendations, must not use drugs or alcohol, and take all medication as prescribed. If she does all of that with no violations, the prosecuting attorney will reduce the charge to a moving violation causing death, a one-year misdemeanor with two years' probation. She will not be allowed to have any contact with the victim's family. Meinke's sentencing is at 11 a.m. on May 2. Olson, a pastor at First Lutheran Church, was on his way to get coffee last May when the crash happened. Meinke struck his vehicle and he was pronounced dead at the scene. Olson died just days before his son's high school graduation.